Understanding where wildlife goes provides valuable information to help manage species. 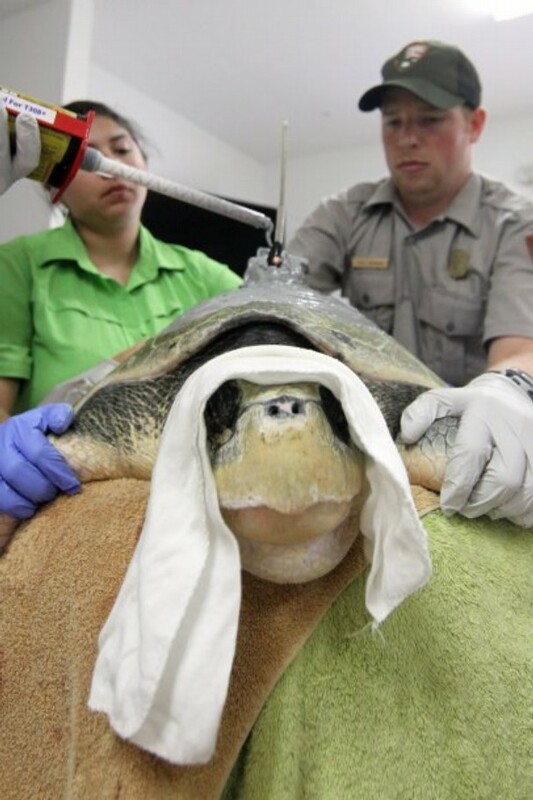 Dr. Donna Shaver uses the newest GPS technology in tandem with satellites orbiting12-thousand miles above earth, to track endangered Kemp’s Ridley Sea Turtles on the Texas coast. We’re conducting this tracking because we want to get an idea about the habitat usage by these adult females. Dr. Shaver is with the National Park Service. We want to see where they’re going in the marine environment, which is where they spend the vast majority of their life; where they’re going for migration as well as for foraging when they’re done nesting. It takes Dr. Shaver and her team about three hours to prepare a turtle for tracking. We have to sand the shell; we put down the first layer of epoxy, then we’ll affix the transmitter. Then when it’s on here solid, we will paint the surface to help prevent barnacles from adhering onto that area where it [the transmitter] has been applied. see a video of her in action on the Texas Parks and Wildlife YouTube channel. We’re one step closer towards recovering the species someday so that it can be enjoyed by future generations. Trees are habitat for wildlife. And if you’re adding new trees to your landscape, you need to know the rules. People frequently ask how close they can put a tree to the house, because shade on the house obviously is a huge energy savings. The general rule of thumb is you go no closer to the house than the eaves are high. So, if you measure up to the eaves of your house, and it’s ten feet high, then you need to get ten feet back from the house. 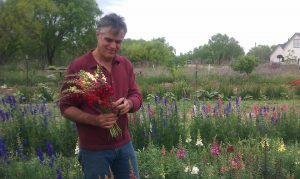 Scott Harris, a certified arborist in Austin, recommends planting only native specimens. You always want to plant your trees at the exact level they were in the pot. Don’t dig a big deep hole, dig a big wide hole. Always use the same soil you took out to backfill. But, you can put your compost underneath the mulch, and then all of that organic goodness will dribble down in the way that nature intended. 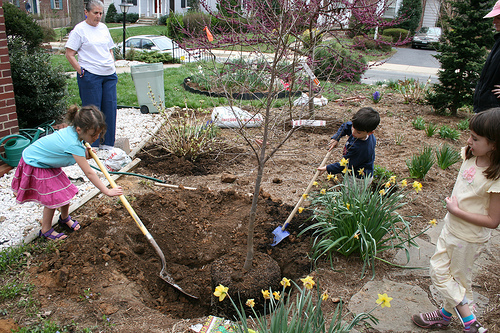 By watering infrequently and deeply, we can help new trees develop extensive root systems. If you just have a little bit of water in one area, that’s where the roots are going to go. But if you water very deeply, it’ll spread into the surrounding soil, and the roots will follow that moisture out. Strong root systems help trees remain strong and withstand drought. Scott Harris, when he also farmed flowers. Image from his Facebook page. Scott Harris is a certified arborist in Austin. Tree planting season in Texas begins in October and continues through March. Just because a tree will grow in Texas, doesn’t mean it’s good for Texas. Harris advises that we exercise caution about what we plant in our yards. Our show receives support from RAM Trucks: Built to serve. Though seemingly obscure, freshwater mussels play a vital role in a multi-million dollar industry. There are at least 300 species of freshwater mussels in North America; Texas is home to more than 50 of those. 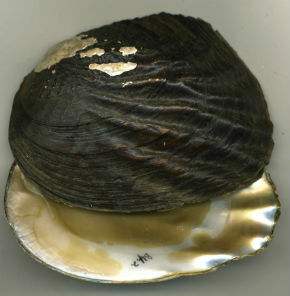 Freshwater mussel species are commercially harvested for their shells. Pieces of which become “seed material” for making cultured pearls. More than 99% of all pearls sold worldwide are cultured. Most freshwater mussel shells end up in Japan, Australia and Polynesia for the cultured pearl industry. Such a pearl begins with a polished sphere of North American freshwater mussel shell that’s surgically implanted into a marine oyster. The oyster identifies the object as an irritant, and begins to cover it with layers of iridescent mother-of-pearl. After about a year, it’s made a pearl. Fifteen mussel species in Texas are listed as threatened at the state level. Six of those 15 species are now candidate for listing under the U.S. Endangered Species Act. Learn more about Texas freshwater mussels and get involved in Texas Mussel Watch on the Texas Nature Trackers page of the Texas Parks and Wildlife website. 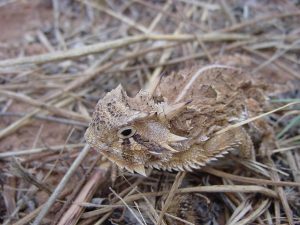 The Texas horned lizard or “horny toad” is a flat-bodied, fierce-looking reptile. Its head is covered with spiky horns, with two central head spines longer than the others. It is brownish with two rows of fringed scales along each side of the body. And this little guy is listed as threatened in Texas. 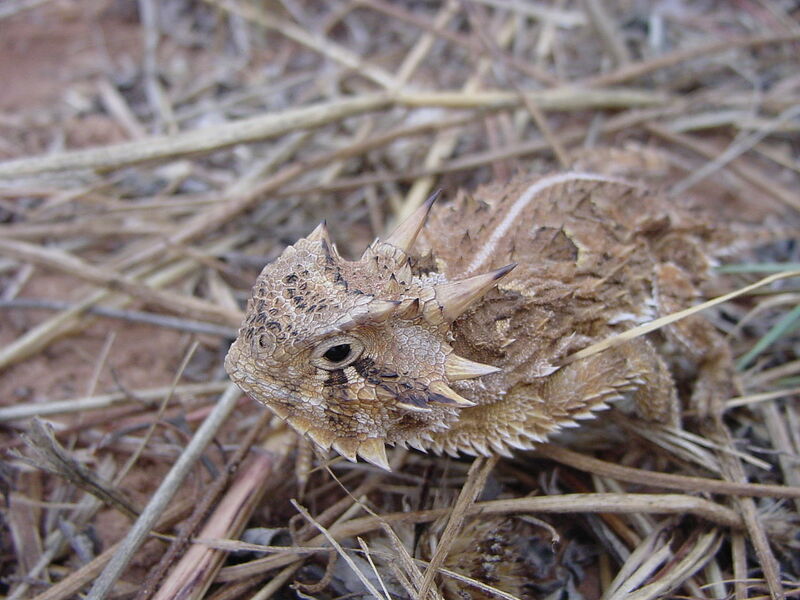 The horned lizard is Texas’ official state reptile, thanks to two young brothers back in 1993. Abraham and Noah Holland, then of Pleasanton, became concerned about the fate of this creature they loved. At the time, the boys were members of the Horned Lizard Conservation Society. They convinced their local State Representative to submit a Bill in the Texas Legislature to honor the Texas Horned Lizard with the status of State Reptile. And so it was done. As if that weren’t enough, the brothers spent several years touring the state as the Traveling Toads. They presented educational programs to thousands of kids and parents throughout Texas. So, if you’re a kid listening to this, and think that you are too young to have grownups take you seriously or to make a difference…talk to the toad. The horny toad. He might convince you otherwise. You are currently browsing the Passport to Texas weblog archives for October, 2018.